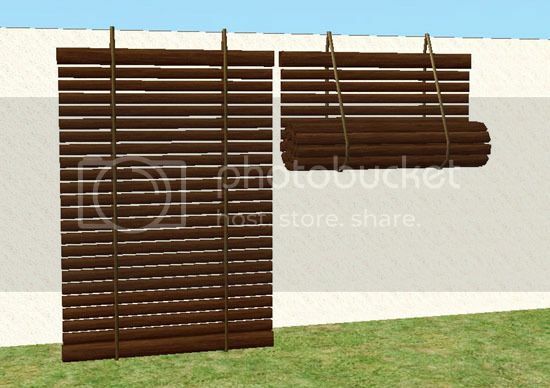 This set contains: Four windows, six doors, two archways, two staircases, three columns, two fences, two borders, two storm blinds, two doorway curtains and two full-length curtains. You can also download the house above – furnished. Find and download it all in the posts below. This is a new and improved version of the Monsoon Build Set. 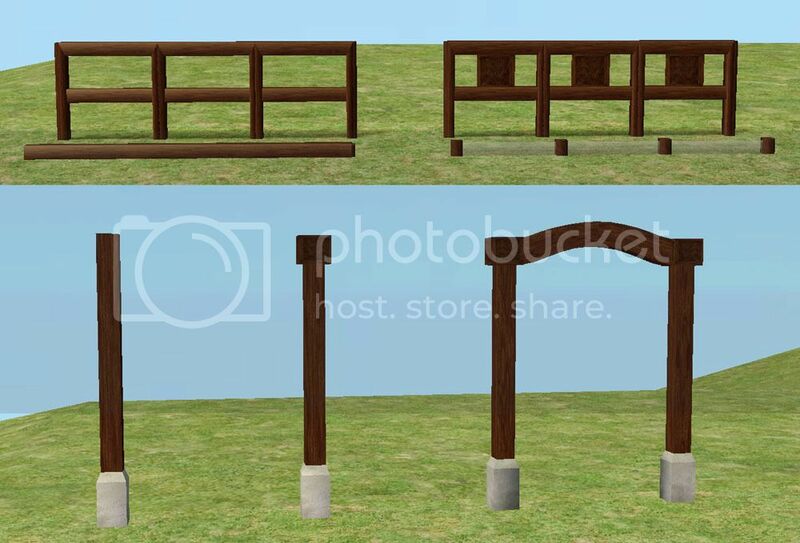 All meshes have been redone and made repository and some textures have been improved. Not all these new versions will overwrite the old ones, so I strongly recommend that you remove ALL old Monsoon Build files from your Downloads folder before adding the new ones. Old recolors by other creators may in some cases not work or look good on the improved meshes. For anybody who knows of other recolors of this set, please feel free to post a link to them in this thread. 1 MASTER objects (counter height window) and 18 SLAVES. 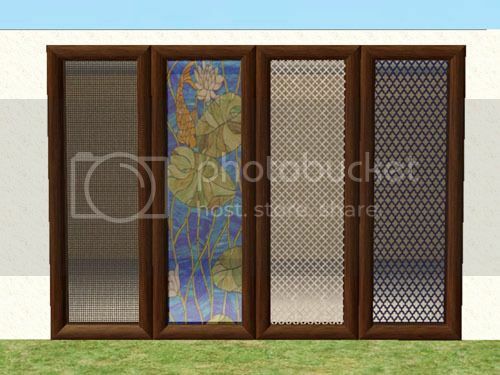 Poly counts: Privacy window - 164 per tile. Small window - 196 per tile. Fullsize - 132 per tile. Double - 148 per tile. 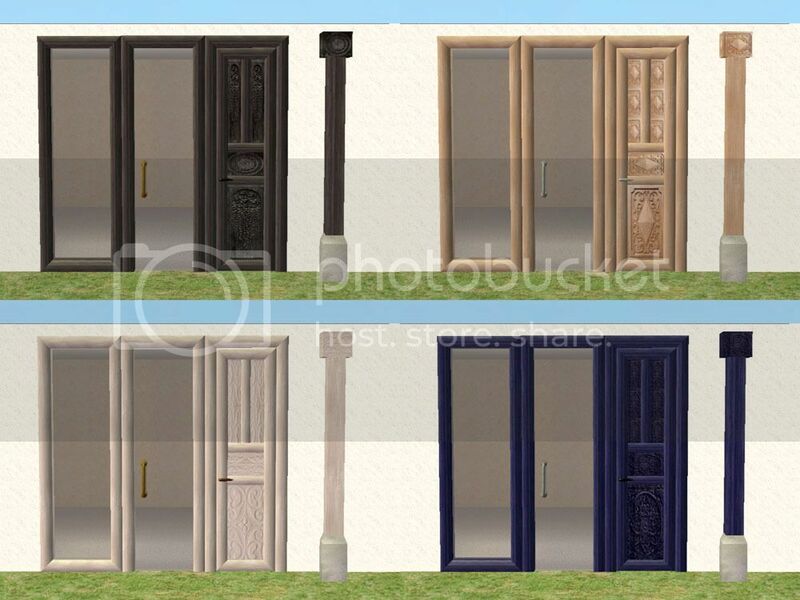 Single wooden doors – 700/736 per tile. Double wooden door - 688 per tile. Single glass doors – 250 per tile. Double glass door – 452 per tile. Single archway – 96 per tile. Double archway – 48 per tile. Poly counts: Railing 1 – 64 per tile. Railing B – 76 per tile. Border A – 16 per tile. Border B – 16 per tile. Column A – 36 per tile. Column B – 48 per tile. Column C (connecting) – 48-272 per tile. SLAVES to the counter height window. Found in Buy Mode under curtains. SLAVES to the counter height window. Fullsize curtain is SLAVE to doorframe size. All have diagonal versions. 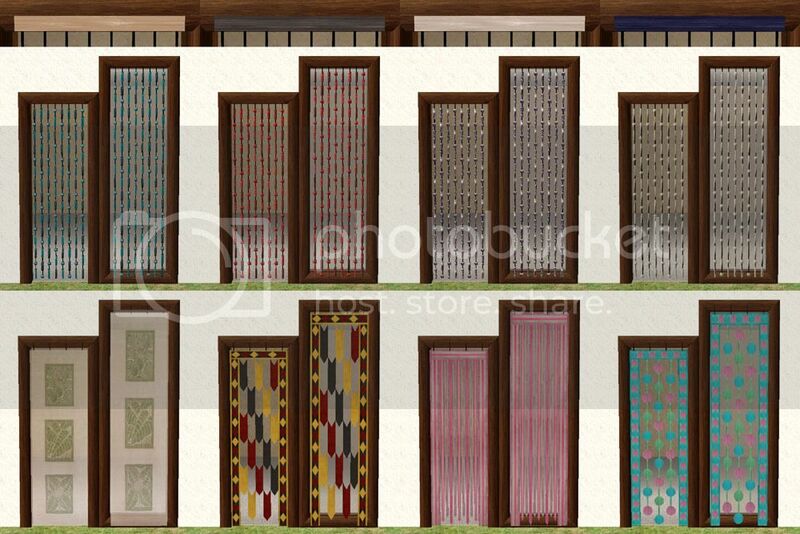 Poly counts: Curtain A (beads) doorframe – 1756 per tile. Curtain A (beads) fullsize – 2078 per tile. 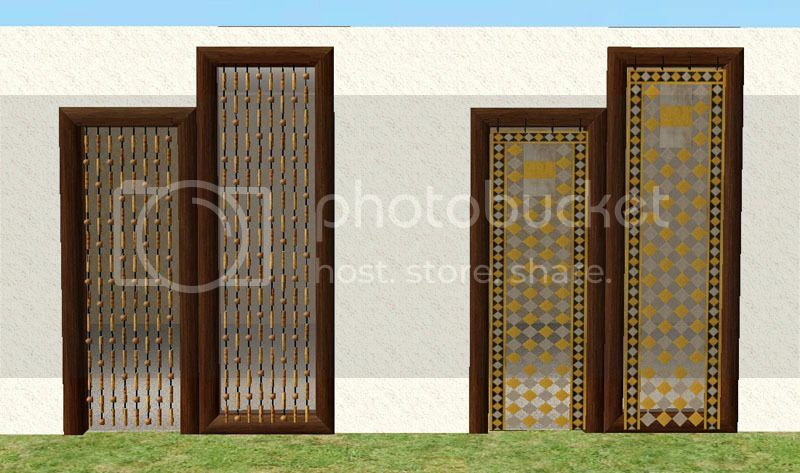 Curtain B (fabric) doorframe – 408 per tile. Curtain B (fabric) fullsize – 408 per tile. Work on windows, doors, archways, staircases, columns, storm blinds and curtains (rods). Built with all EP’s installed (no stuff packs). Lot size: 2 x 3. 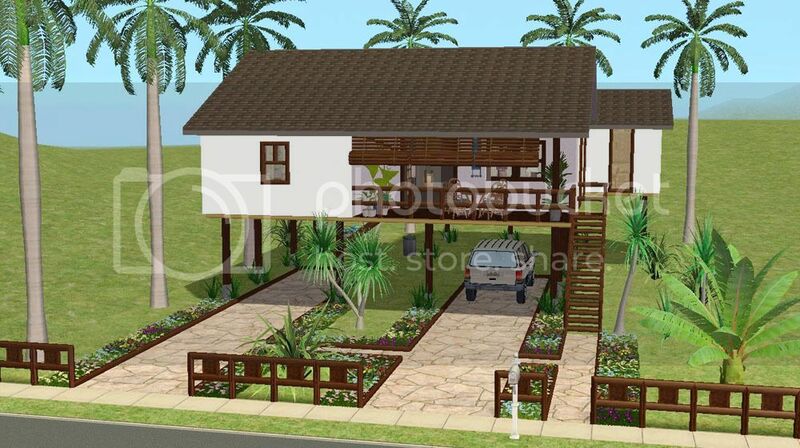 Fully furnished value: 82,841 simoleons. • In the download you’ll find two files – the lot file and a folder called ‘Extras’. The latter contains master objects for slaves used in the house. • Install the lot file as you usually do. • Add the items in the ‘Extras’ folder to your download folder. Moune, this is so beautiful, thank you. Thank you so much for redoing and expanding this beautyful set. Parts of it (the blinds and curtains for example) belong to my all time favorites. You have truly outdone yourself, Moune! This is a fabulous set! I absolutely love it! Thank you for sharing your talent with us, as always.